Pues nada, una chavala que se levanta haciendo poses para empezar el día. Se nota que es un fotomontaje, nadie tiene ganas de posar según se levanta. Bueno, casi nadie. Dibujo a lápiz. Escaneado lamentable. Rise and shine… The photo was obviously photoshopped, nobody wakes up so gorgeous and in the mood for posing… Well, almost nobody. 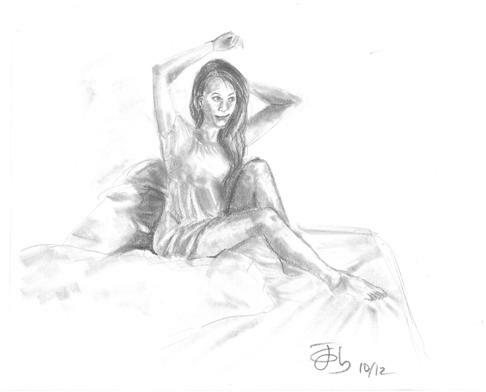 This is a quick pencil drawing. Poorly scanned. Me gusta la sanguina, da a los dibujos un toque entre renacentista y preescolar plastidecor. I like the “feel” of sanguine drawings , they have a look between Renaissance-like (if well drawn) and kindergarten’s crayon (in my case). Un dibujo a lápiz facilito, me hizo gracia la cara de loco que pone el violinista. Otro músico, se ve que el tema me atrae… El original se ve mejor, porque al escanear el dibujo el lápiz produce brillos y, por ejemplo, la melena queda fatal. 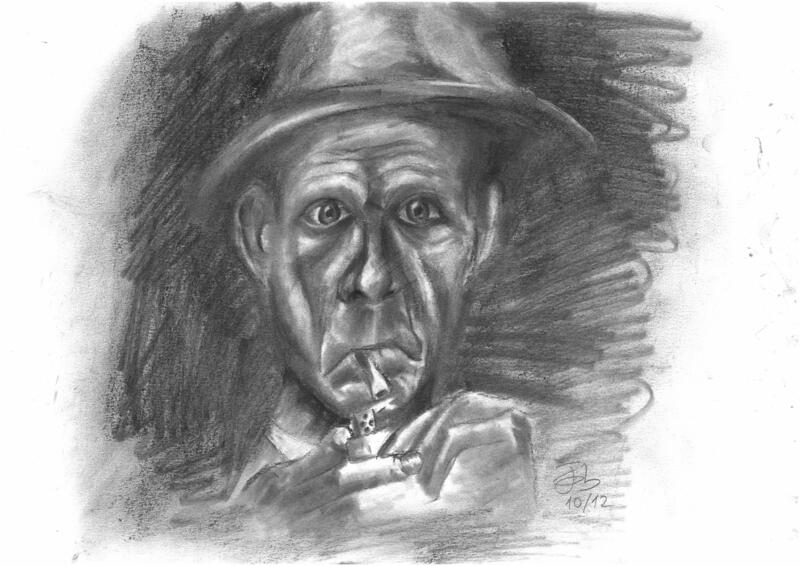 I made this quick pencil drawing of a fiddler because of the crazy face of the character. Really funny. 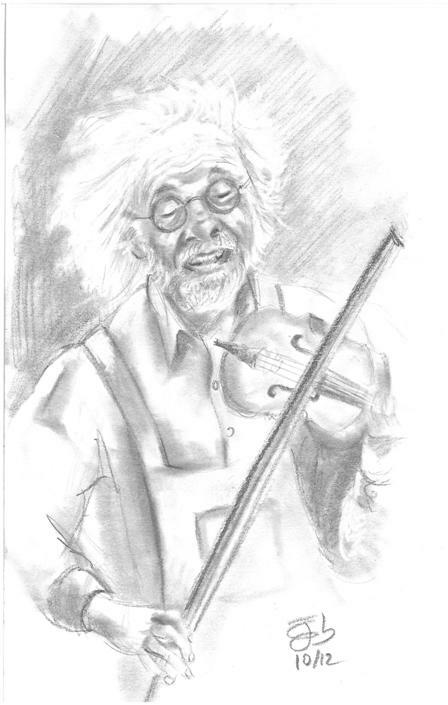 The original drawing looks better because of the reflections of the graphite when being scanned, that spoil the hair of the fiddler completely. Me gustó mucho la foto de estos dos chavales pasándolo fenomenal no se sabe por qué. Ni falta que hace… es un dibujo a lápiz que hice en un ratillo. The photograph was really beautiful, two kids having a great time no reason why… and no reason needed, just for the sake of being happy. 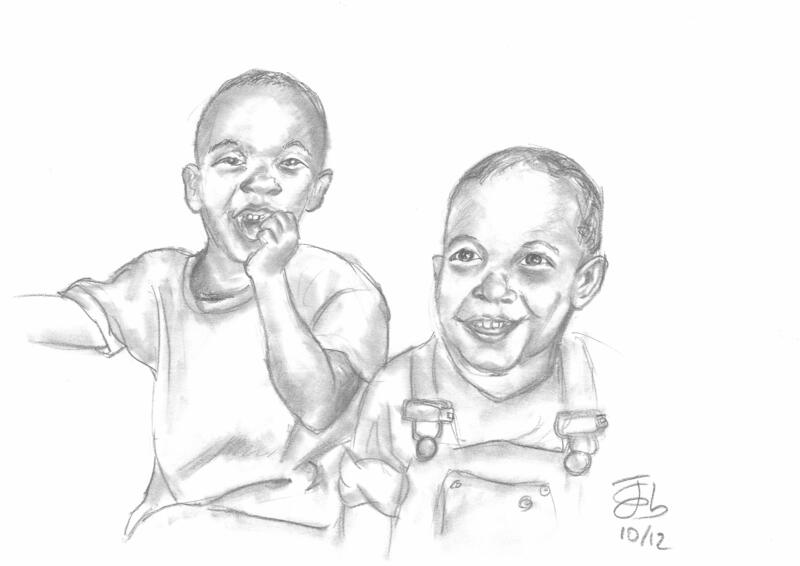 This is a pencil drawing that took me a very short time, just for fun. This is the story of Saint Peter and his martyrdom, quite a great story, good old Saint Peter demanding they crucified him upside down… really tough guy. 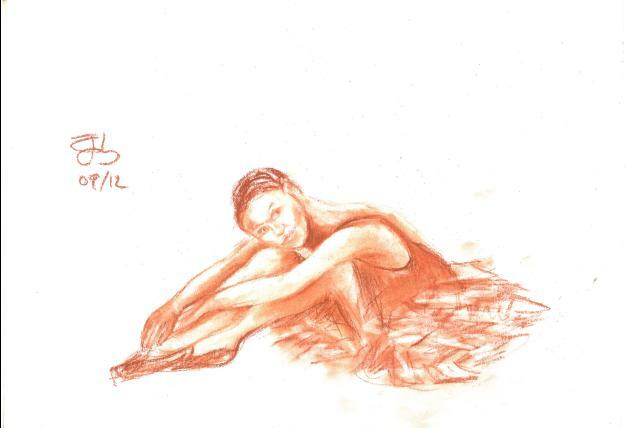 This is a draft in red chalk (sanguine). I find it quite difficult working in detail with it, so I use it for rough drafts, just for fun… Everything appears blurred. 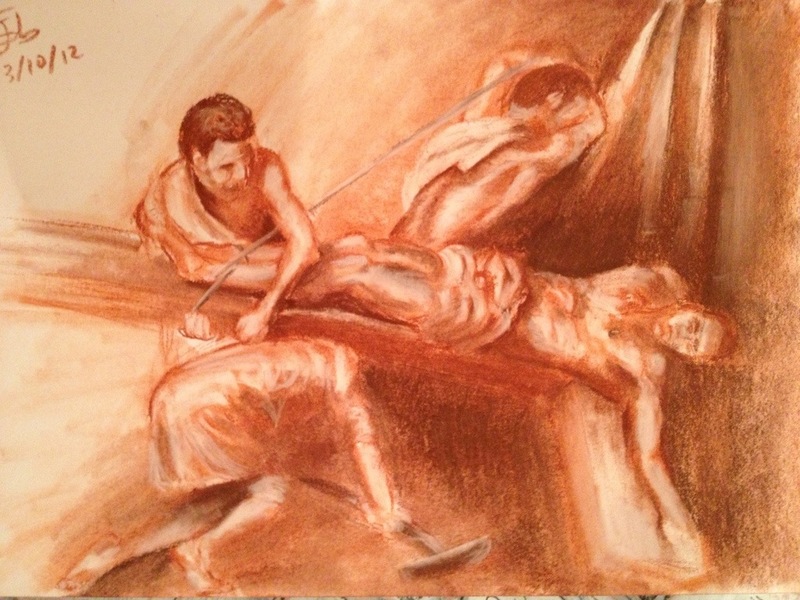 Again, this is based on a photo based on a play based on a picture by Caravaggio… so many foundations for nothing. No consigo que me quede bien un dibujo al pastel ni a la de tres… El pez en realidad queda mejor porque no se ve tan azulón, queda más “color pez”. El caso es que me parece que me limitaré a los pasteles hipercalóricos, no a los de pintar. Eso sí, colorido no le falta. 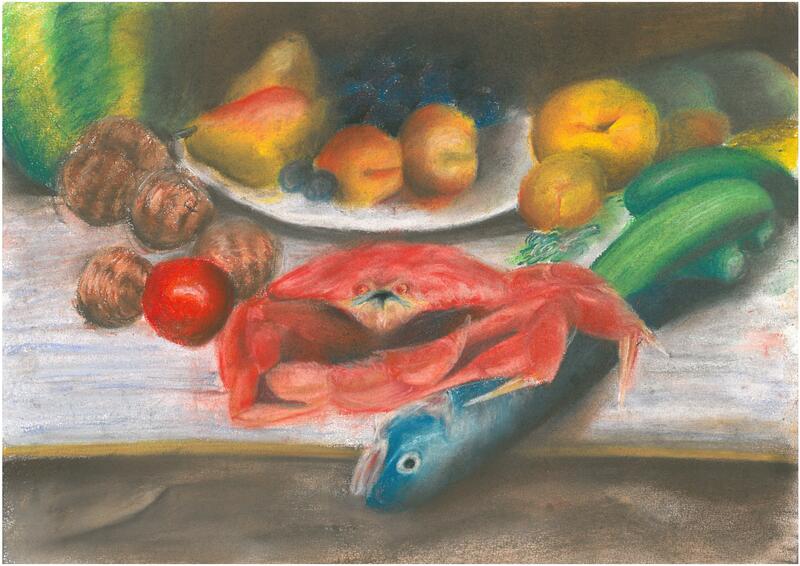 I can’t make a proper pastel drawing, I find it a very complicated technique… The real drawing looks better because the fish is in a more real “fish colour”, but eventually I am always disappointed when finishing a pastel drawing.